This was about the National Art Council's Project Lava. The idea was to pair up a visual artist with a poem, and have the artist create something based on his interpretation of the poem. 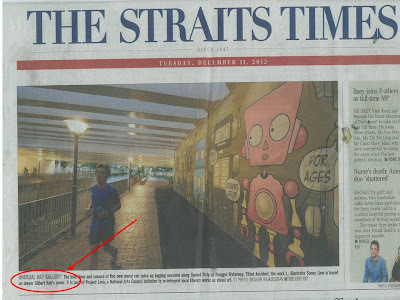 In my case, the artist was Sonny Liew (who has previously illustrated Iron Man for Marvel Comics - how cool!) 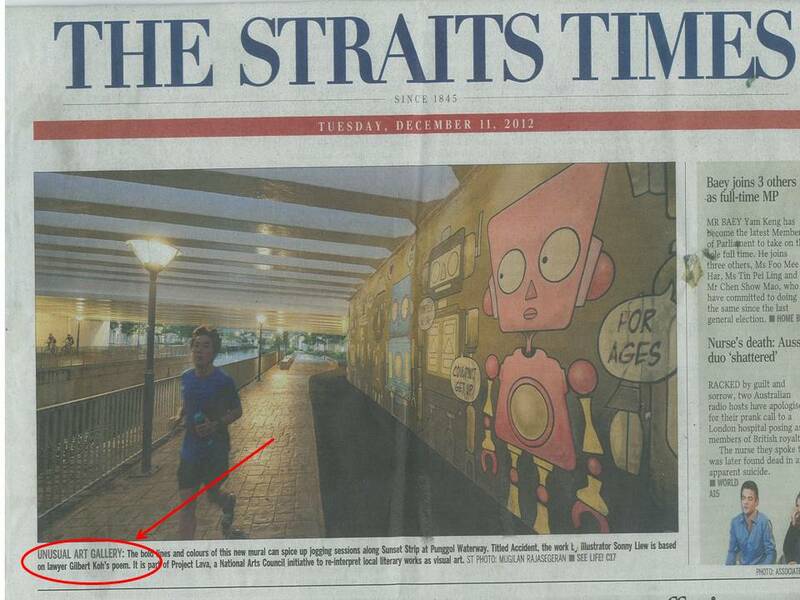 who created a very large mural (16 x 4 metres) at Punggol Waterway. The mural incorporates an old poem of mine Accident. 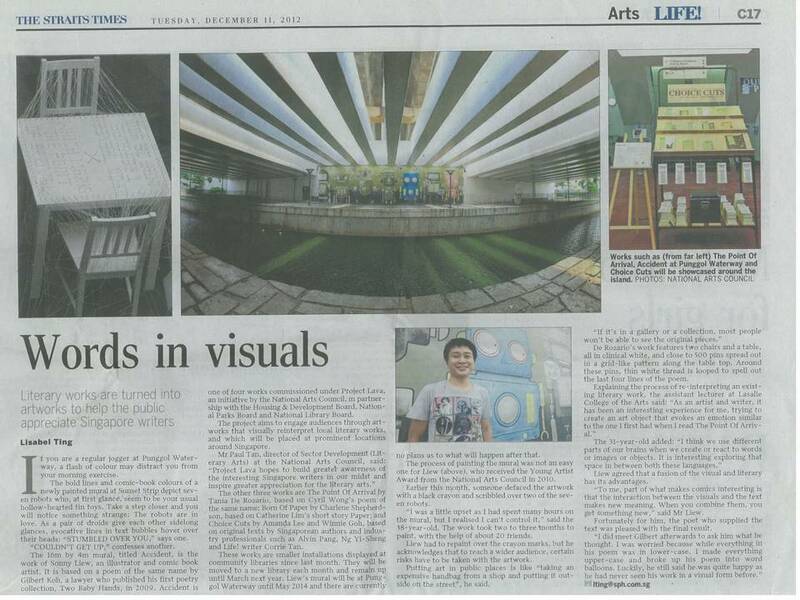 More details in the follow-up article in the ST's Life! section. Accident is a short little poem about a chance encounter blossoming into love. I wrote it around 1997 for my girlfriend (now my wife). Although the poem is only a few lines long, it seems to have made an impression on many readers. In fact, Oxford University Press has previously asked for my permission to reprint this same poem as an introduction to one of their books, Gazing at Stars (2011). Jeremy Boo made an excellent documentary in 2011 about dementia (Before We Forget). He followed up in 2012 with a book on the same topic. The book is a collection of stories, photos and essays, from Singaporeans who have had a loved one suffer from this disease. Jeremy not only included one of my old poems, Grandmother's Garden in this book, but also entitled the book after my poem. 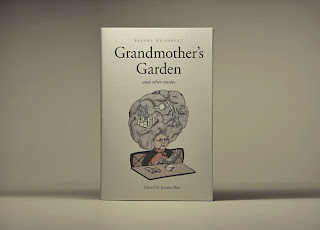 So there you have it - Grandmother's Garden and Other Stories. Inside the book, there is also an evocative, abstract, black-&-white, vaguely disturbing, artistic interpretation of my poem. (Hmmm, I wonder if there's something about my poetry which attracts artists who want to create pictures about poems). 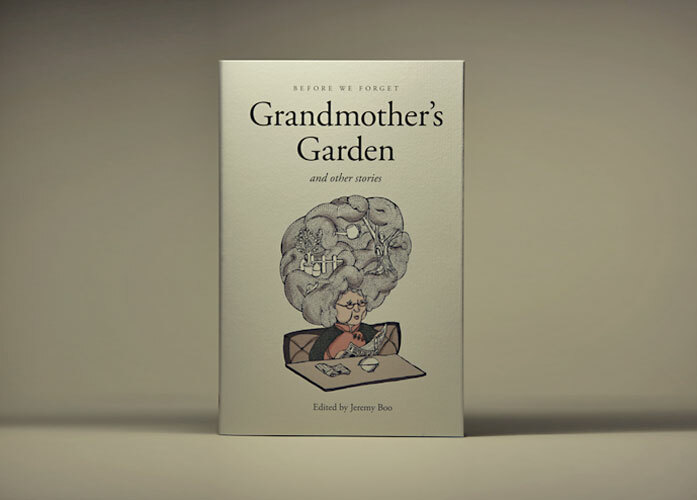 The illustration shows the contours of an old woman's face rendered as a garden, with a huge tree growing out of her eye, blocking out the old woman's view of reality. Well, dementia is like that. The book launch for Grandmother's Garden was quite an interesting event, that one. Partly because of the historical legacy of the venue. I was allocated an honorary seat and got to sit in the chair of former Deputy Prime Minister Goh Keng Swee. MP Denise Phua was the Guest-of-Honour and spoke sincerely and movingly about her own mother, who is suffering from advanced dementia. Book sales at the event were very brisk, I autographed many people's copies, and all sale proceeds went to charity. I was invited to write a poem for the kids' section of the Sunday Times. I've never really written anything for kids before, so I decided to give it a shot. Besides, they promised to pay me a few hundred bucks (hmmm, I just realised that I still haven't received payment). Look at the monsters beneath my bed! One is purple and the others are red. When Dad's around, they're rather glum. But first they will always close the door. Fannie the Fink, and Grolly the Grump. My poem Garden City was first published in Quarterly Literary Review Singapore about eleven(!) years ago. It's nice to know that there are people still interested in it today. This year the National Institute of Education featured the poem in Enl*ght, its publication for secondary English Literature teachers. 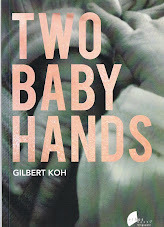 In this article, we will look at Gilbert Koh’s “Garden City” and Margaret Atwood’s “The City Planner”, both written by two people from very different contexts and cultures, and examine how despite such differences, the two poems indisputably share distinct similarities as they comment on the role of nation-building and to a larger extent, modernisation and urbanisation via social engineering. This article takes apart the two poems to provide a guided comparative analysis and suggested questions which may be used as a resource in the classroom. This poetry pairing activity is targeted at the Upper Secondary level, and may potentially yield interesting and rewarding results should teachers design relevant activities to help their students relate to and engage personally with the themes and issues present in the poems. ... Both poems are similar in the sense that they are critical of modernisation, urbanisation, and its dehumanising effects on the individual. While “Garden City” evokes biblical allusions to satirise the nation’s ‘fall from grace’ – Paradise, the true Garden of Eden – in her “steel and concrete” quest to “expand” and “develop” into a city, “The City Planners” juxtaposes vivid imagery with an oppressive silence and lifelessness to effectively explore the binary oppositions of rationality vs. insanity, and order vs. chaos in order to comment on the unnatural dehumanising effects of city planning on both inhabitants and planners. It was a little disappointing to me, though, that the article steadfastly refused to comment on the political aspects of my poem. I am sure that the commentator knew that the poem is actually about Lee Kuan Yew and the control he exerted over the creation of modern Singapore. But this, after all, was the National Institute of Education, and so the article carefully refrained from making any overtly political comments. Lee's name was mentioned nowhere. Then there was Old Folks Home. For several years now, the Ministry of Education has featured the poem in the print version of its Literature in English Lower Secondary Resource Kit. So a fair number of young Singaporeans today have had to study my poem in class. If I recall correctly, one year Cedar Girls School (or was it Saint Nicks?) even used it as an exam question. In 2012, the new development was that the Ministry wrote to me again and asked for permission to include the poem in their upcoming online Guide to the Literature in English Teaching Syllabus 2013. This guide is for Upper Secondary students. I said yes. I think that these are official online resources for Literature teachers only, so I will probably never see how the poem is presented or discussed. But it's nice to know that the poem lives on somewhere. It's a gently ironic poem, about the unbridgeable distance between the young and innocent, and the old and dying. as outlined in the CCA syllabus.